Check the FAQ below to see if your question is already answered. If your question is not answered, please send me an email (address below). Game does not load, what do I do? If the game does not work for your device, it is possible that the device/OS is incompatible with the game, despite best efforts to identify all compatible devices. Refunds can be issued if the game does not work on your device. See below for details. For Google Play, please send an email to [email protected] to explain that the game does not work on your device. Refunds may take several days to process through Google Play and your bank. Also, note that you can actually request a refund from Google Play on your own if you recently downloaded it. For the Apple App Store, please follow these instructions: https://www.imore.com/how-to-get-refund-itunes-app-store (Unfortunately, the developer has no ability to issue refunds directly). This message may appear if your device has certain website restrictions enabled. To fix this, add http://localhost to your list of allowed websites in Settings → Restrictions → Websites. How do I transfer my city to a new device (or from the free to the paid app)? Use the Upload option in the settings section of the game (top right gear icon during gameplay). A code will be shown, and you can use the code to download that city onto any other device. This also works when moving from the free to paid Android app. All press and YouTubers can get promo codes if they want to share the game through reviews, coverage, gameplay, etc. Please email [email protected] to request promo codes for iOS or Android. Does the game support landscape mode? 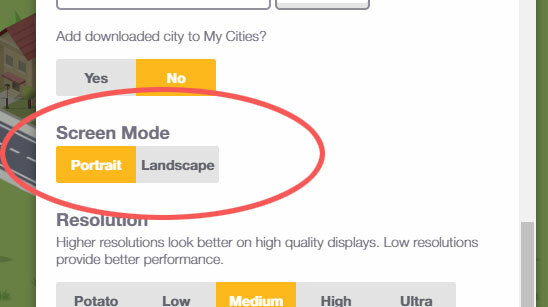 Yes, landscape mode is supported, but it must be activated manually in the settings section of the game. Click the top right gear icon to open the settings section. Note: The gear icon won't display during the tutorial. On some devices, the game may start in landscape mode if you hold the phone in landscape mode when opening the app. What is the difference between the Free and Paid versions (Android)? Is there a free version on iOS? No, only a paid version exists on the iOS App Store. I monitor feature requests in the subreddit https://reddit.com/r/pocketcity, and in the Discord channel (linked in the subreddit). I plan to add new features to the base game over time, but can't guarantee which features will make it in. In general, the highest requested features will be the ones that I will consider adding the most. Why has my city stopped earning cash? 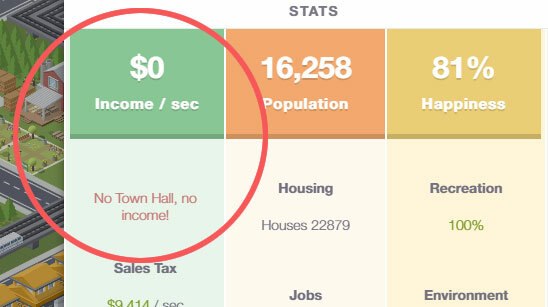 Ensure a Town Hall exists. If your Town Hall is destroyed by a disaster or demolished for construction, your city can't operate and your income is frozen! Make sure you aren't attempting to supply resources using highways. Only basic roads can supply power and water. Highways can be used to additionally reduce traffic congestion, but shouldn't replace roads entirely since they can't supply resources! How do I use the railway? Build a railway to connect different zones together, similar to roads. Build Sky Rail Stations (Services -> Traffic) beside the rail. Congestion will be removed near the stations. The more stations that are connected by a rail, the more congestion will be reduced. How I upgrade special buildings? Certain buildings, like the Police Station, can be upgraded. Tapping on it will reveal an upgrade button next to its thumbnail at the bottom of the screen. Why doesn't the Town Hall have any customizations unlocked? Customizations are unlocked as the player levels up. Buildings cannot be rotated. It would take a long time to create each additional sprites to represent every angle of each building (since each building would need 4 sprites instead of 1). Certain gameplay trade-offs have to be made and this feature won't be implemented. Can I move buildings after building them? No, once a zone or building is built, it cannot be moved. It can be demolished, however. Plan strategically! How do I remove rocks and mountains? Dynamite and terrain options are unlocked by levelling up. Dynamite can is used to remove rocks, and terrain options can be used to remove both rocks and mountains. How do I reduce upkeep? Upkeep increases as the number of zones increases. It is the maintenance cost of the zones in your city. 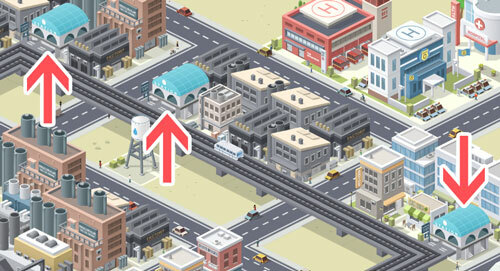 The player must maintain an income that is higher than the upkeep in order to reach a positive cash flow! Ensure you are building the right zone types at the right time so that useless zones are not created. Why isn't my city uploading? Currently, using Emojis or punctuation in your city name may cause the city upload to fail. Please use a name that contains only alphanumeric characters if they need to be uploaded. Also, an offline device cannot upload cities. Will you be adding new languages? Translations for multiple languages are planned to be added in the future. Email [email protected] for other unanswered support issues.